Russia has been buying tons of gold for months, with their central bank buying more gold than produced by Russian mines for the first time. They might now start importing gold, with China joining recently. “China’s on a bullion-buying spree as Asia’s top economy expanded its gold reserves for a fourth straight month,” says Bloomberg. Russia’s USD reserves have fallen from 46% in mid-2017 to now 22% of the reserves. Much of it replaced with gold, which now accounts for 20% of their reserves. 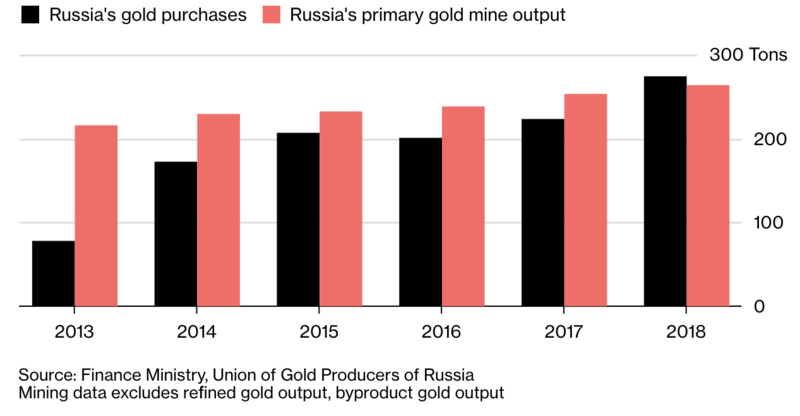 Russia buys more gold than it produces for the first time, April 2019. “The surge in interest in the concept of gold-backed cryptocurrencies has raised the question of whether one of the many experiments being launched can aspire to become a leading global currency. Only a sovereign could amass the quantities of gold needed. Does this mean that Russia is considering the idea? Venezuela and Iran have made some attempts already. Rumors have been circulating for a while that the Russian authorities are interested in taking plans to a new level, perhaps with China and other partners. Both Iran and Venezuela are known to have consulted with Moscow regarding their asset backed crypto plans. Venezuela’s Petro has arguably failed because they did not go with a first class open public blockchain, while just what Iran is doing remains hazy. Latest news from there is of a banks consortium of sorts launching a project to tokenize gold and other assets, primarily Real Estate. Iran also had talks with a number of European nations, as well as Russia, to carry trade through crypto after plans to launch a Rial stable coin. 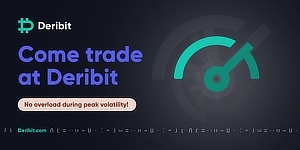 Much has come out from Russia, including suggestions of their SWIFT equivalent running on the blockchain, of potentially buying trading oil in crypto, trading with Iran in crypto, as well as potentially a single crypto currency for the Eurasian Economic Union. That’s in words. As far as actions, the main thing to come from Russia is some of the highest bitcoin volumes in the peer to peer exchange Localbitcoins, reaching $14 million recently, far more than all of America or the European Union. A gold backed crypto would make sense for them, at least as a backup in case they’re cut off from correspondent banking – and thus international trade. The way this would work is quite simple. You designate 1 crypto token as say 1 gram of gold, whoever wants it sends fiat, they receive the token, and the gold is perhaps held by the Bank for International Settlements (BIS) with intermediary banks then handling the redemption and creation. 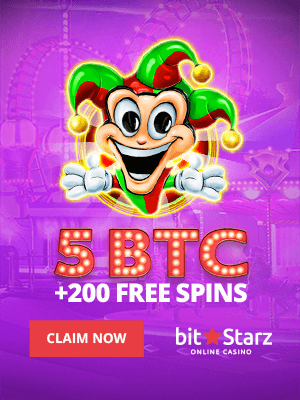 The aim for going through these intermediaries would be for the crypto to have a stable value while otherwise it functions somewhat similar to bitcoin depending on how it is designed. The design can range from Petro, which is effectively fiat, to say our own Trustnodes token which is set in stone and can’t be changed now, making it little different than bitcoin. For a gold backed token it would have to be somewhere in-between, unless they do what we did and print say a billion tokens through the smart contract with each such token then worth however much gold and with the smart contract no longer changeable by anyone with no backdoors, no freezing functionality, nothing basically except it stating there are x tokens which do move and the ownership balance changes accordingly. Otherwise it can have a more centralized design at a technical level, like Tether, but that would add another level of trust in addition to the centralized mechanism, trust that can scarcely be found when it comes to any government. It is probably unlikely this will go out anytime soon even if it is planned except for maybe at a small scale for testing as a pilot etc. A more interesting question might be which government will be the first to start stockpiling some bitcoin or eth to add to their reserves. That’s because while such gold token or oil token would be interesting, it still wouldn’t quite have the qualities of bitcoin or eth as there would still be BIS or whoever as a counterparty and counterparties usually mean risk. While with bitcoin or eth, they are natively global, natively digital, have no counterparty, need no correspondent banking, and while they are volatile, gold is too, as is every other asset, with that volatility so far generally in one direction in a long enough timeframe. They are not the only country that is buying gold like crazy. Countries like China are doing the same. And why? Because it’s actually something with real value, instead of USD toilet paper.